The ‘basic income’ proposal Switzerland is voting on this weekend will probably fall at the polls this time. But it’s an approach to regulating the work – life balance that we’re definitely going to be hearing more about in future – and not just in Switzerland either! Switzerland will become the first country in the world to hold a nationwide referendum on the introduction of a basic income on Sunday. The proposal, if passed, would give every adult legally resident in Switzerland an unconditional income of 2,500 Swiss francs (£1,755; $2,554) a month, whether they work or not. Supporters point to the fact that 21st-Century work is increasingly automated, with more and more traditional jobs, in factories, retail and even in finance and accounting, being done by machines. And they do not need salaries. In fact the idea of a basic income is not new. In the 16th Century Thomas More suggested it in his famous work Utopia. In the 20th Century economists from both the left and right argued that it could be a good idea. American economist Milton Friedman, who was a staunch proponent of free market capitalism, supported basic income because, he argued, it would allow what he called “a rag-bag of specific welfare programmes” to be abolished. But despite all the debate, the idea of a basic income has never really caught on – until now, perhaps. In Finland, the government is considering a trial to give basic income to about 8,000 people from low-income groups. Different groups would be given different amounts, to try to find out whether more generous payments would deter people from seeking paid work. Meanwhile the Dutch city of Utrecht is also developing a pilot project for basic income. Around the world, many governments, from Australia to Canada, are taking a closer look at the administrative costs of running complex welfare systems and asking themselves whether a basic income would simply be cheaper. Campaigners like Che Wagner are ideologically committed to the concept regardless of the cost, because they believe the current situation forces people into work they often do not enjoy, and which does not allow them to choose other activities they might enjoy more, and which could be equally useful to society. But Professor of Labour Relations Andy Stern believes increased automation, as illustrated by those dancing robots, is the most important reason for governments to think very seriously about basic income. “Any good country needs to think about what’s next,” he told Swiss television. 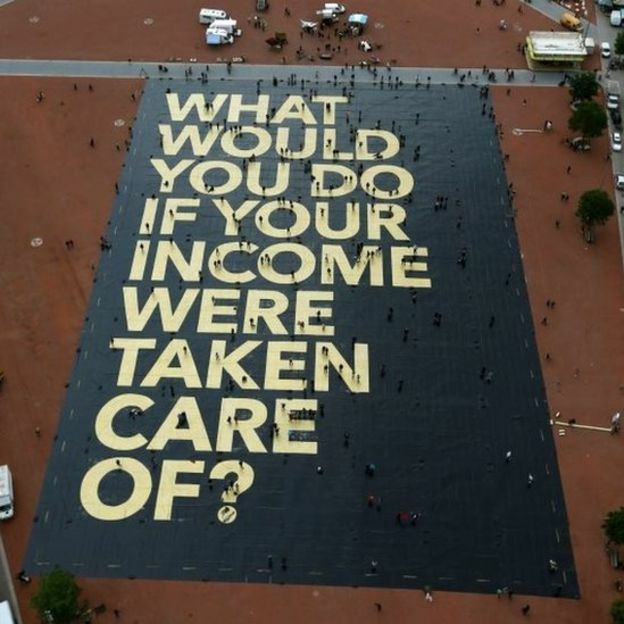 But there are many big questions over the Swiss proposal on basic income. For a start, although supporters have suggested a figure of 2,500 Swiss francs a month, they have offered no ideas on how that could be financed. Instead, they say, if Swiss voters back the idea, Switzerland’s parliament will have to work out how to implement it. Unsurprisingly, perhaps, there is little support among politicians for basic income: not a single parliamentary party has come out in favour. But what is a surprise is that none of the political parties have cited cost as their main objection. Instead, there are concerns about encouraging a “lack of initiative and personal responsibility”, and of not providing young people with a real incentive to find work. Business leaders, already facing a skills shortage in many areas, are also alarmed. But a key argument against basic income, and the one likely to sway many Swiss voters, comes from the right-wing Swiss People’s Party (SVP). Switzerland could easily afford to introduce a basic income, argues SVP representative Luzi Stamm, but not when Switzerland has a free movement of people agreement with all 28 EU member states, many of whom have a far lower standard of living. Like all European countries, immigration is a hot political topic in Switzerland. And the Swiss may be nervous about measures which could make their country more attractive than its neighbours. Latest opinion polls suggest voters will reject basic income. But the campaign has created a lively debate about how people will live, and work, in the future, and for Che Wagner that is already a victory.